Pistachio nuts are very small but tasty. Celebrate National Pistachio Day, that falls on February 26, with a handful of delicious nuts. Pistachio nuts are the member of cashew family. They are closely related with mango and even poison ivy. Pistachio trees produce bunches of fruit, like grapes, and nut is the seed of that fruit. Iran is the world leader in producing pistachio nuts. This country produces over 2,000 tons pistachios per year! By the way, pistachios are called “smiling nut” in Iran. Pistachio nuts are very popular in Asia they are called “green almonds” and “happy nut”. One myth says, that if you hear the pistachio shell cracking, that will bring you good luck. 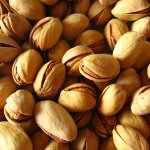 Pistachio nuts are great as a roasted snack and as a flavor for desserts. Pistachio ice cream with its distinctive green color is not one of the world's famous, but it's certainly very popular. So don't waist time and go cracking pistachio nuts to boost your fortune or just enjoy delicious dessert with pistachios on National Pistachio Day!